Shop our collection of signed Manchester United memorabilia including autographed items from the major players. Signed Manchester United shirts, boots, balls and photographs. Most items come with a photo of the actual signing! 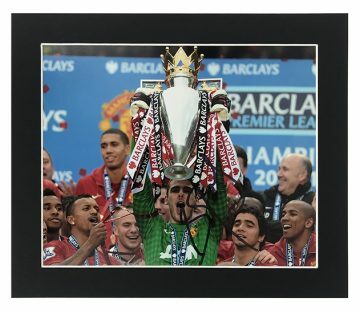 All signed Man Utd items come with a certificate of authenticity, free UK delivery & fast worldwide shipping! Manchester United was formed in 1878 and is one of the oldest in the English Premiership. Starting out as Newton Heath LYR Football Club, it changed its name to Manchester United in 1902. It moved across town to its current location in Stretford’s Old Trafford in 1910. The ground has developed massively over the years and now has a capacity of almost 80,000 seated fans. Man Utd is the most valuable football club in the world with a capitalisation of just over £3.8bn. It was something of a rocky time when the Glazer family bought it in 2005, with some fans opposing the move. The takeover proved to be a smart move as they paid just £800m at the time. Manchester United is not simply a football club – it’s also a multi-million dollar business and successful global brand. Season tickets for Manchester United attract a hefty price tag – up to £950 for one years’ membership. Merchandise is equally pricey – with the club estimated to earn almost £500,000,000 from its adoring fans all over the world. The famous red, white and black strip has been seen in many a cup final over the years but non-more memorable than the famous 1968 win against Benfica in the European Cup. They won 4 -1, being only the second UK team to win the trophy. Fame and notoriety have followed the club over the years. The tragic Munich air disaster in 1958 being a terrible low. It took many years to recover but now the club flies high with 13 Premiership titles since the league’s inception in 1992. Manchester United is the most successful club in British football with 20 League titles, 5 League Cups, 12 FA Cups and 21 FA Community Shields to their name. Their Man Utd roster of players reads like a who’s who of football royalty with George Best, Bobby Charlton, Wayne Rooney and David Beckham all finding fame and fortune at the club. 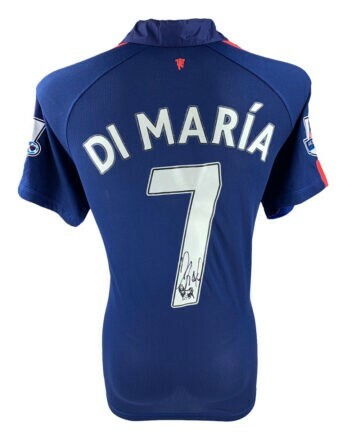 Browse our signed Man Utd shop where you will find all kinds of autographed items from the club. We stock signed Man United shirts, goalkeeper gloves, football and football boots as well as autographs on a number of player and team photos. 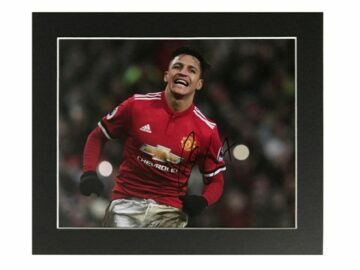 Locals, of course, know the club as Man United or simply Man U, but whatever your name for the Red Devils we have a piece of Manchester United signed memorabilia for you!